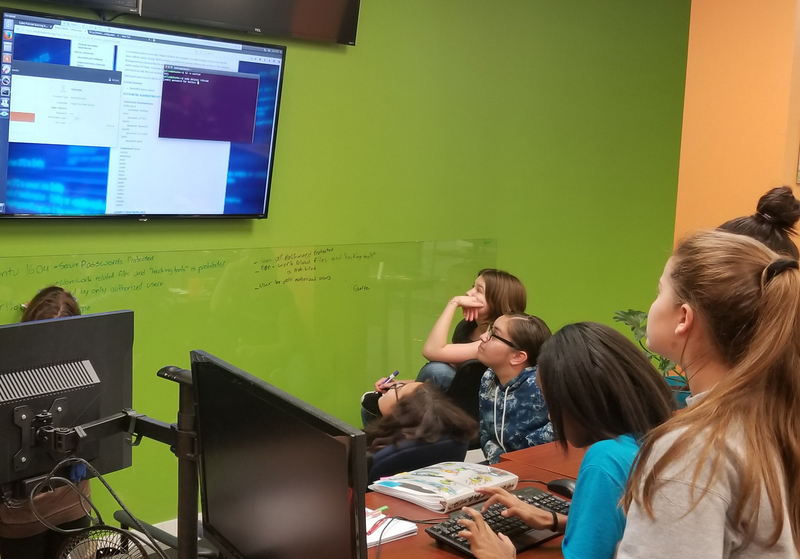 While many of Kenosha’s local youth spent their fall weekends the way most teens typically do, eight young ladies from the Kenosha School of Technology Enhanced Curriculum (KTEC) invested their free time learning how to defend our nation’s cyber infrastructure. If you are a business owner, leader, or concerned community member you should be very interested in how these students came to be part of a nationwide competition focused on cyber-defense. Perhaps, as importantly, you should be thinking about how Kenosha County can work to retain their talent and develop more. Local technology consulting and services firm Leeward Business Advisors (LeewardBA) has been partnering with KTEC to create learning opportunities and real-world hands-on experiences for students from 4K to 8th grade. On October 6, 2018, eight KTEC middle-school girls started their first CyberPatriot Competition training. Over the course of 15 weeks, they learned the inner workings of Microsoft Operating Systems, Linux Operating Systems, networking, and internet systems. They did not study theory; they did not memorize answers for quizzes; they did not fill out worksheets. These students engaged in hands-on workshops to assess, prioritize, and remediate information systems’ threats to real-world data integrity, access, and confidentiality. They were coached in the application of risk management, threat detection, and information-security best practices. On November 8th things got real! The girls, divided in two teams, logged into live computer systems provided by the US Airforce, and executed their game plan. They inspected systems for viruses, audited user account privileges, remediated policy settings, and evaluated data integrity using a file-hashing algorithm. During the competition rounds, of which they competed in three, the teams were on their own. No outside involvement was allowed, other than distributing pizza and reloading on snacks. The students applied the same knowledge and strategies employed by full-fledged cyber-security professionals many years their senior. The security threat to our national computer infrastructure and business systems is significant. Each year one in five small businesses will be attacked. Sixty percent of those impacted will suffer losses so significant that they will be forced to close down their business. Hacking and malware attacks have become so sophisticated that “professional” malicious hackers have created and lease hacking toolkits as a service on the Dark Web that are easy enough for anyone to use. Attacking networks, business systems, and websites has become a commodity service. The only successful protection is active management of these systems by well trained and experienced professionals. Now Kenosha County has eight more resources on their side with a bright future helping to protect our business, government, and education information assets. Our community needs to support more programs and partnership like what KTEC and LeewardBA have developed. Kenosha County needs more real-world hands-on opportunities to prepare our students to secure their future and ours. Local businesses should be encouraged to get involved and demonstrate there is real opportunity for advanced information security careers right here in our county. What if we do not? What if these brilliantly talented resources leave our area? Perhaps it is best we don’t find out. Ready to get involved? There are several great ways to support programs like this and many more that can be created through local partnerships. Contact Kristen Kief or Michael Polzin to learn more. You can also join other community leaders at the 6th Annual Fit for Growth Gala to support this kind of innovative education. Learn more here.